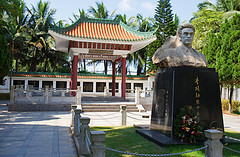 Lishuoxun Martyr Monument is at the northern end of Xunting Road. The southern end of this road begins at Haifu Road just south of the Haikou East Bus Station. It is an easy walk from the bus station. When I visited the place was deserted except for a caretaker. He went into the main hall and turned on the lights for me. There are some interesting old photographs and some display cases with examples of clothing, documents etc. Unfortunately there is no information in English.